It’s as much of a holiday tradition as dreaming about Colin Firth in Love Actually: that post-holiday freak-out when you realize just how many times you went back for seconds at all those parties and potlucks. Um, could you ever turn down another helping of your grandma’s famous stuffing? Didn’t think so! But get this: The holiday season doesn’t have to wreak havoc on your waistline! Rowdy Yates, fitness manager at Crunch Gyms, let us in on the secrets to staying trim despite those holiday temptations. It’s 2 p.m. on a Friday and the bars of downtown Davis are, for the most part, quiet. But at the new Davis Beer Shoppe on G Street, a steady stream of customers strolls up to the wide wood counter to order a pint, which they sip leisurely to the tune of Irish folk music. Owner Taylor Ramos keeps an eye on the proceedings, appropriately distracted for a guy who just opened the shop in March and found himself with a near immediate fan base. “Right now we’re just trying to get what we have under control,” Ramos said in between greeting customers. At the newly-opened Denny’s restaurant in Las Vegas, diners can have their cake and eat it, too — their “Pancake Puppies” wedding cake, that is. 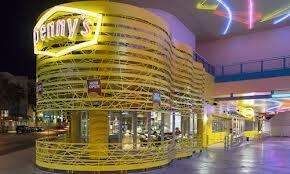 The Vegas location will be the first Denny’s to include a wedding chapel, meaning guests can get married and hold a wedding reception inside the restaurant. Couples will be able to tie the knot in the first quarter of 2013, Denny’s Chief Marketing Officer Frances Allen told HuffPost Weddings. Though the chapel will be a first for the company, it won’t be the first time people have gotten married in a Denny’s restaurant.